Medical Communications, publisher of the peer reviewed clinical journals Medicine Today, Cardiology Today, Endocrinology Today and Pain Management Today is pleased to announce the results of the 2016 annual syndicated readership survey. Average issue readership (AIR) for its flagship journal, Medicine Today, has risen strongly by 4.7% to 69%. Clinical journals increased their readership result for the second year running, proving GPs dedication to print media is stronger than ever. Notably, driving the upward trend for Medicine Today were the youngest GPs, adding 22.3 percentage points in AIR for this age group –an increase of 43.3%. Medicine Today’s average issue readership increased to 69%, remaining in line with that of AFP at 69.5% and now statistically equivalent to Australian Doctor at 71.6%. The increase of the AIR results for the clinical journals reflects the evidence that doctors in general practice including, and indeed especially, young GPs still strongly prefer their clinical education information delivered in a printed form, with their reading habits largely unchanged by digital alternatives. 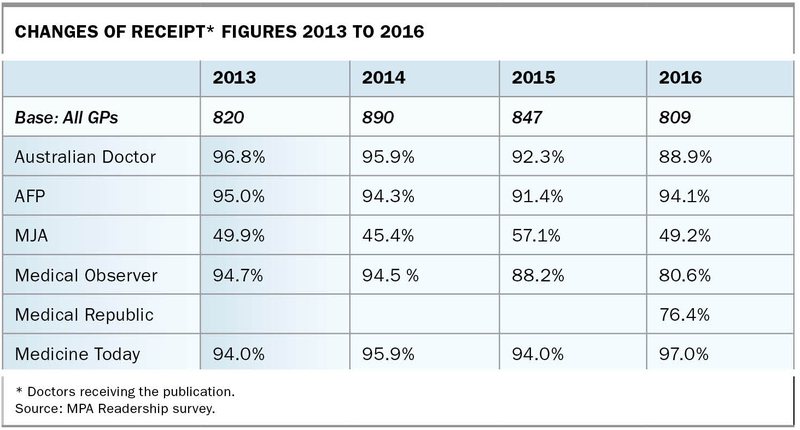 68.8% of high prescribing GPs read Medicine Today within the publication period. The strong result for clinical journals further cements the key insights from the latest Medical Information Channel Analysis Study (MICA), commissioned by Medicine Today Group in late 2015. The MICA Study, which measured 24 different information channels, showed that print clinical journals continue to be amongst the top five information sources of choice for GPs. Of those channels available as a marketing vehicle, clinical journals ranked number one. The MICA study also demonstrated that clinical journals work synergistically with pharma representatives when combined to communicate marketing messages to GPs. In keeping with proven GP reading preferences, Medicine Today Publications continues to launch more print titles, with the distribution of the first issue of Respiratory Medicine Today and Medicine Today Reprints in Dermatology in 2016 and Paediatrics Today to follow in 2017.